Give your tabletop a classic touch with the innovative design of our Marble Dinnerware Collection. 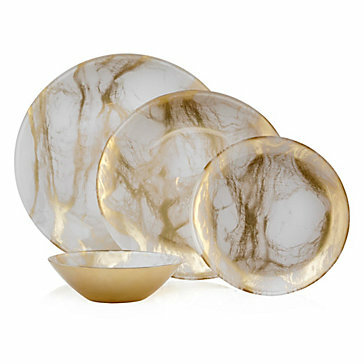 Made from soda lime glass, each plate features a unique white marbled finish, with swirls of silver or gold to coincide with your impeccable taste. Soda Lime Glass, Lead free paint. [value] => The plates I purchased are really nice. But not my favorite. No flaws just fell out of love with them. The plates I purchased are really nice. But not my favorite. No flaws just fell out of love with them.